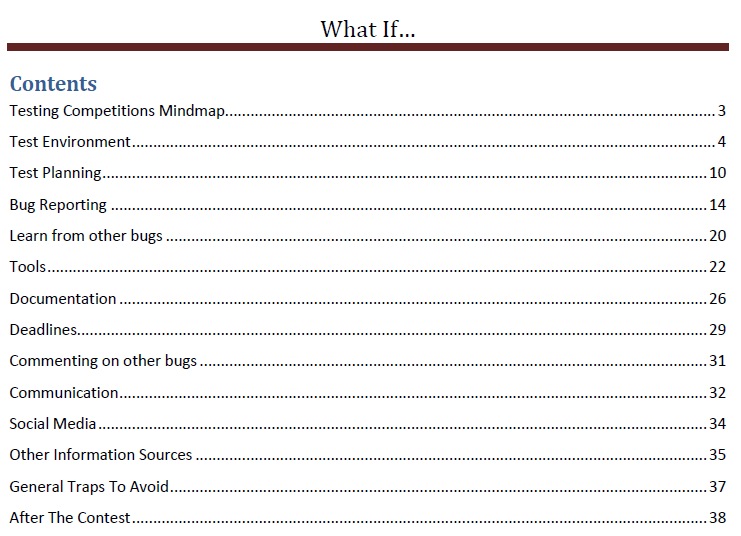 Enjoy testing: Release of my ebook: "What If... : 50+ tips to win testing contests"
October 16th, I released my first ebook titled - 'What If...'. It is a collection of tips on software testing. Thanks to everyone for your wishes, more than fifty copies were sold. 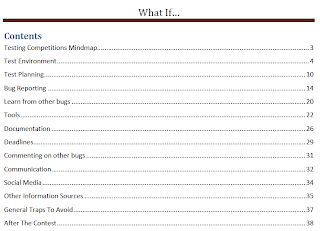 "What If... : 50+ tips to win testing contests"
This book is a collection of tips which might help any tester competing in a testing contest. Testers are under tremendous time pressure and the competition is tough. Skilled testers have a better chance of winning the contests. After participating in a number of testing contests, I realized that it is easy to win any contest if you dedicate some time and demonstrate the right skills. In this book, I have tried to highlight few points which will improve your chances of winning the testing contest. As seen in the image above, initial chapters focus on test environment, test planning. Then the focus shifts to bugs - finding important bugs, bug reporting and finally learning from the testing contests. Just like my first book - "What If...", the tips are short and to the point. Focus is on ready-to-use tips. Hope you enjoy reading the book and win many more contests. How can I buy your books? 1. Please transfer INR 200 to the following bank account. 2. Once I receive the money, I will email you the book. Do I get any discount? Praveen Singh - Director of www.99tests.com for founding 99tests. It is an excellent platform to participate in testing contests and learn from other testers. I learn from every contest at 99tests. It is a tough task to review any book. Alek, Bernice and Elena helped me by reviewing the entire book. Thanks to them, I am able to release the book on time. Hope this book helps you win at 99tests and many other testing contests. @Sumit, how do I contact you? Congrats on the release of your e-book. You can use some of the services which would allow you to automatically deliver the e-book and receive payment in a paypal account or bank account, this way it will be easy for you and the readers who would like to purchase the book, they will get instant delivery. I was trying your book on Jumadi.in website. It website id down. Yes. The website is down :( You can contact me on my email id and I will email you the books. Hi Ajay. Was surprised to see ur sms at 5 in morning. I did reply to u on ur sms. U not only a champ at testing but also a great learner from others bugs. Your books have been a rick source ok good stuff of all the time. I have started sharing with some of my students and frieds. The most important bit is they are very simple and easy to adopt.